Advances in medicine, technology, and science have led to ever-changing procedures in the medical world. One of these changes has been the increasing use of modern medical carts in hospitals, doctor’s offices, and other medical facilities. Gone are the days of the forgotten medical cart pushed haphazardly to the corner of the room. Today’s medical carts are easily accessible and more efficient than ever. They combine technology and medicine. This use of technology at the patient’s bedside is a boost to patient care, as well as a convenience to doctors, nurses, and other medical staff. Just how does a modern medical cart help patients and increase efficiency at the bedside? Patient records are a critical tool in the health care industry. Health care providers today are using Computer-based Patient Records almost exclusively. This is a recommended and widely-recognized benefit for patients. With a modern medical cart, doctors and nurses have all the necessary information at their fingertips—in real time, as they converse with the patient. This means that when a patient brings up a new symptom, a strange side effect, or a puzzling concern the medical team can review the patient’s history immediately. No flipping pages, shuffling through binders, or searching for notes is necessary. From imaging results to lab tests to medication lists to allergies—the modern medical cart uses technology to put all the patient’s history right at the bedside. Easier access to records reduces mistakes. With the patient’s history and notes in one compact location, medical staff can make informed decisions more quickly, and with confidence. A provider can see the patient’s allergies at the push of a button. They can review an accurate medication list immediately. This results in a safer environment for the patient as the provider works with them one-on-one. Staff can take their computers with them from room-to-room. This cuts down on the time it takes to run back and forth from the patient bedside to nurse station. When it’s time to switch shifts, all the patient records are accessible and in reach just steps away from the point of care. It makes the transition between shifts smoother and more efficient, allowing the staff to offer more time for patients and their needs. 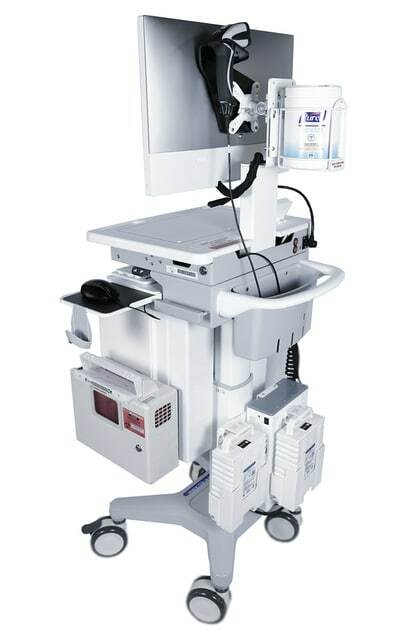 Today’s modern medical cart combines medical devices in the cart. This means supplies—even medications—are within easy reach. No more lost blood pressure cuffs or overlooked thermometers. A more usable cart amounts to a better-quality piece of equipment, which equals less money spent on duplicated supplies and overlooked devices. Cutting down on healthcare related illnesses is a top priority in health facilities. Providers wash hands between patients and wipe down devices regularly. With the sleeker, more efficient designs available today, medical carts are easy to sanitize. This means less contamination between patients and staff members. After assessing a patient, staff can give the medical cart a quick wipe down to sanitize, before seeing the next patient. Each cart is equipped with a hot swap battery system. This time-saving and cost-reducing measure is a system to keep the cart powered up at all times, allowing the cart to be live even when changing out batteries. With three batteries in the hub at all times, the cart has power for up to 16 hours. This adds up to less lost information and more time spent doing what matters most—caring for patients.